A simple diagram illustrates the region's alliances and hatreds. Confused about what’s happening in the Middle East? 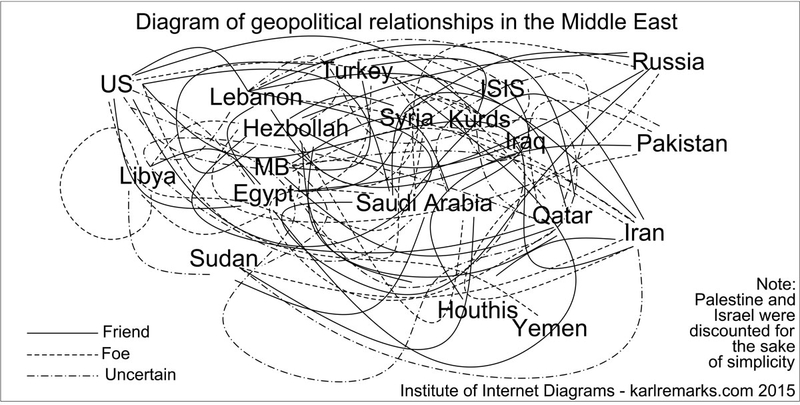 No need to worry—our research team at the Institute of Internet Diagrams has come up with the ultimate explainer in the shape of an interactive diagram that sums up the geopolitical alliances traversing this ancient region, which dates back to the Mesozoic Era. The diagram clearly maps out the relationships between the main players as well as external powers, like the United States and Russia, that are deeply involved in the region. It is best to view the diagram using 3-D glasses, but the graphic will still work if none are available. While it is common to hear people describe the Middle East as a complex and obscure place, the diagram plainly illustrates that this is not the case. The relationships follow logical patterns reflecting geopolitical interests, partnerships, and conflicts. For example, the United States is evidently on friendly terms with Iran. In Iraq. But America is on the opposite side of the conflict in Yemen. In Syria, the U.S. and Iran are both against and with each other, depending on the outcome of the nuclear talks. By carefully following the lines one by one, you can see that Egypt and Qatar are against each other, except in Yemen where they are now allies; Saudi Arabia is both supporting and bombing ISIS; and Libya is its own worst enemy. But it’s best if you draw your own conclusions; the diagram only takes about three minutes to understand fully. After which, you will be qualified to advise President Obama on Middle East policy.